This morning we got up early to dry some tomatoes and a few peaches. 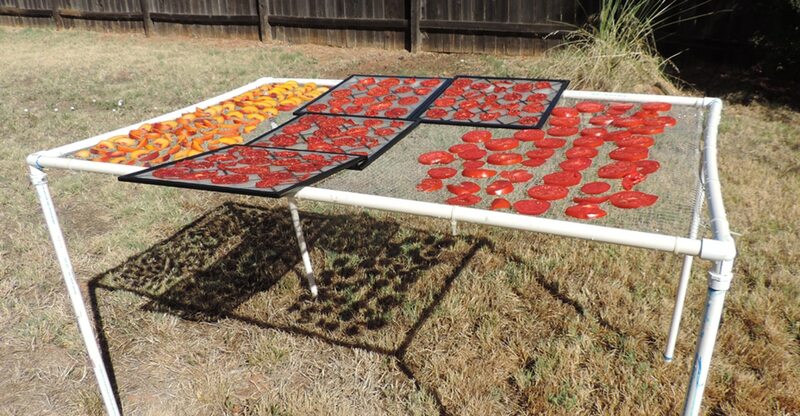 It is going to be a hot day, so we decided to use an outdoor drying rack (An Easy to Make Drying Rack). 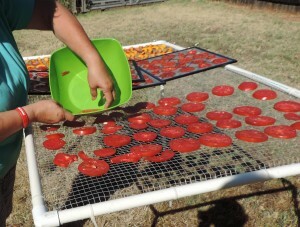 Tomatoes dry well and are easy to prepare. 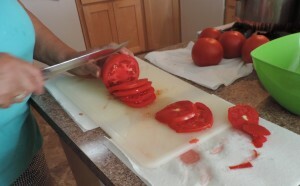 Start by making sure the tomatoes are not over ripe. The best tomatoes are large ones that are just starting to get ripe. You want them to be firm. Wash your tomatoes and remove any damage or bad areas. Slice them into evenly sized slices about a ¼-inch thick. Spread them out on the drying rack early in the day and they should be finished by nightfall. As long as it is a nice hot day and they are in direct sunlight, we have not had a trouble with birds or bugs. If you leave them out in the cool evening, the birds and bugs will attack. Today should be in the high 90’s, so they will dry fast. It is best if your products are not touching each other when on the drying rack. If you look at the pictures of the rack, you will notice that there are a few peaches and some racks from the Excalibur Dehydrator. We had some tomatoes that are almost finished in there, but my wife decided to finish them outside to save running the Excalibur. She will write a blog on how she uses the dried tomatoes. This entry was posted in preserving foods and tagged drying racks, drying tomatoes, Howard. Bookmark the permalink.